Bonnet, F, Manegold, S, Bjorling, M, Cao, W, Gonzales, J, Granados, J, … Shasha, D. (2011). 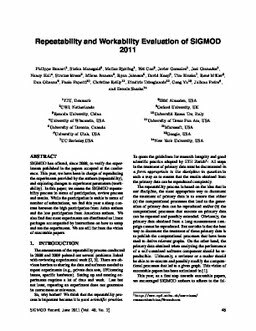 Repeatability and workability evaluation of SIGMOD 2011. ACM SIGMOD Record, 40(2), 45–48.